St Wilfrid spread the knowledge of the Benedictine Rule, brought religious treasures from the Continent, and helped improve the chanting of the liturgy. He was a great builder at York, Ripon, and Hexham. He was one of the first to conceive the idea of Anglo-Saxons evangelizing the Germanic peoples. 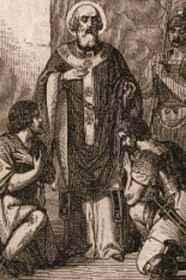 St. Willibrord, the apostle of Friesland and patron saint of Holland, was his devoted pupil, and he also consecrated St. Swithberht. During Edwardtide we celebrate the life of St Edward the Confessor, King of England 1042–66, the re-founder of Westminster Abbey. Edward preserved much of the dignity of the crown and managed to keep the kingdom united during his reign of 24 years. His close ties to Normandy prepared the way for the conquest of England by the Normans under William, duke of Normandy (later King William I), in 1066. Canonised in 1161, to this day pilgrims come to pray at his shrine. Callistus was born to a Christian slave who had a Christian master in second-century Rome. He was placed in charge of a Christian bank which went broke. He fled the city, but was caught and sentenced to the treadmill, then later to the tin mines. He was later ransomed and returned to Rome. As a deacon he was hired by Pope Zephyrinus to administer the Church’s property and organize the burial of martyrs in the catacombs on the Appian Way, still named the Cemetery of Saint Callistus. O God, who by reason of the singular merits of thy blessed Bishop Saint Wilfrid, didst cause to shine forth in him many wondrous works, we beseech thee, mercifully to grant, that like as we have learnt from his teaching to seek earnestly after all things heavenly, so we may at all times be defended by his intercession. Through Jesus Christ, thy Son our Lord, Who liveth and reigneth with thee, in the unity of the Holy Ghost, ever one God, world without end. R. Amen. O God, Who hast crowned the blessed King Edward, Thy confessor, with the glory of eternity, make us, we beseech Thee, so to venerate him on earth that we may be able to reign with him in Heaven. O God, Who behold how we fail in our weakness, mercifully restore us to Your love through the examples of Your Saints. Through Jesus Christ, thy Son our Lord, Who liveth and reigneth with thee, in the unity of the Holy Ghost, ever one God, world without end. R. Amen. Brethren, of other priests there was a succession. Since death denied them permanence; whereas, Jesus continues forever, and his priestly office is unchanging; that is why He can give eternal salvation to those who through Him make their way to God, He lives on still to make intercession on our behalf. Such was the high priest that suited our need, holy and guiltless and undefiled, not reckoned among us as sinners, lifted high above all the heavens; one who has no need to do as those other priests did, offering a twofold sacrifice day by day, first for his own sins, then for those of the people. What He has done, He has done once for all: and the offering was Himself, our Lord Jesus Christ. Here was a great high priest whose life was acceptable to God V. Where shall we find another to keep the law of the Most High as he kept it? Alleluia, alleluia. V. Ecclus 45:9 The Lord loved him well and ennobled him: He clothed him about with a robe of honour. Alleluia. 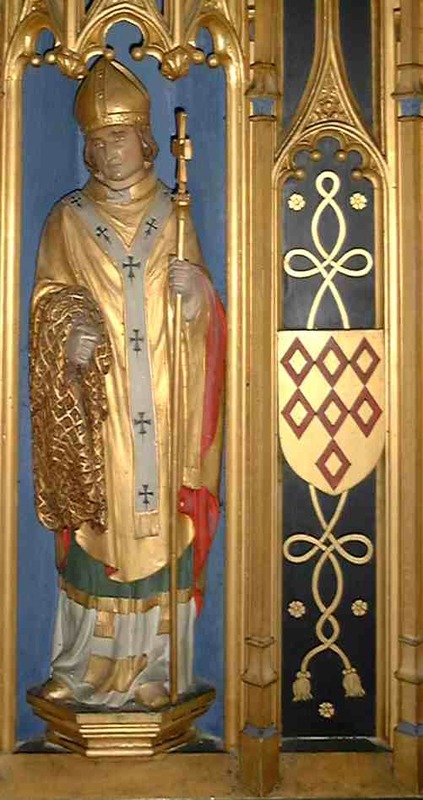 We offer sacrifice unto Thee, O Lord, on the solemnity of blessed Wilfrid, Thy bishop and confessor, humbly beseeching that the sheep which have gone astray may return to the one fold and be nourished with this food of salvation. Through Jesus Christ, thy Son our Lord, Who liveth and reigneth with thee, in the unity of the Holy Ghost, ever one God, world without end. R. Amen. We offer Thee, O Lord, sacrifices of praise in commemoration of Thy saints, by whom we trust to be delivered from evils both present and future. May this sacrificial offering help to cleanse us of our sins, O Lord, and to assure us of Your everlasting salvation. Through Jesus Christ, thy Son our Lord, Who liveth and reigneth with thee, in the unity of the Holy Ghost, ever one God, world without end. R. Amen. Refreshed with the victim of salvation, we supplicate Thee, O Lord, that, through the intercessory patronage of blessed Wilfrid, it may always and everywhere be offered to Thy name. Through Jesus Christ, thy Son our Lord, Who liveth and reigneth with thee, in the unity of the Holy Ghost, ever one God, world without end. R. Amen. We, Thy suppliants, who are refreshed with Heavenly food and drink, beseech Thee, O our God, that we may be fortified by the prayers of him in whose commemoration we have par-taken of these gifts. We beseech You, almighty God, that these consecrated gifts may cleanse us of our sins and by their effect make us lead holy lives. Through Jesus Christ, thy Son our Lord, Who liveth and reigneth with thee, in the unity of the Holy Ghost, ever one God, world without end. R. Amen.